. I’m reminded of the wonderful musical storytelling of favorite artists like Robin Spielberg, David Lanz, and Spencer Brewer. 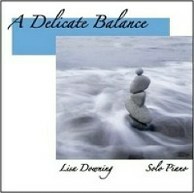 I expect that A Delicate Balance will be one of my favorite albums of 2010. “The Gift” is the opening piece, and is a composition that came to Downing all at once during a tumultuous time in her life. A graceful energy flows through the piece that is both thoughtful and life-affirming. The sweet and dreamy “The Bedtime Song” refers to a time when Downing and her young son made up original songs together at bedtime each night. This melody was a favorite, conveying love and innocence. “Make Believe” is one of my favorites. Composed while watching her son building things with his Legos and creating a fantasy world with his teddy bears, the piece is playful yet intense and slightly mysterious, winding down at the end like a music box. “Lost” goes to the opposite end of the emotional spectrum, expressing the emotions felt when her beloved teenage son ran away from home for three weeks. The piece ends with a major chord, indicating that story has a happy ending. “Indecision” expresses the frustration and confusion of trying to make life choices and decisions - an amazing portrait of those troubling feelings. “A Diaphanous Breeze” is another favorite. Inspired by a thick haze of cottonwood seeds drifting on the wind, the piece is dreamy, sensuous, and gorgeous. “Night Games” emerged while watching a group of neighbor kids playing in the cul-de-sac under the glow of a street lamp. Energetic and full of fun, it’s a delight! “Speaker/Listener” refers to a powerful tool for developing intimacy, where one person speaks his or her truth and then the listener speaks what he or she has heard. The piece elegantly conveys the message of several unique voices reaching out to each other. A Delicate Balance is an incredible musical experience that shouldn’t be missed! It is available from LisaDowning.com, Amazon, CD Baby, and iTunes. Very highly recommended! 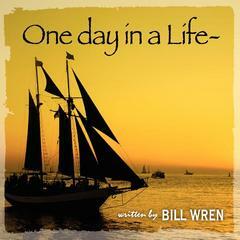 One Day In a Life is the debut release from “Texas Songbird” Bill Wren. Warm, lush instrumental music casts a spell and creates a mood of contentment and well-being. It is interesting to note that Bill Wren composed all of the music on the album, but he is not one of the players. Some of the music is quite orchestrated and some is guitar and accompaniment. Strings (live and programmed), percussion, keyboards, voices, sax, and penny whistle combine with the guitars to tell evocative tales that are visual and often have a cinematic sweep. Focusing on the desire to move people with his music, Wren says,” I want to create music that moves the heart in a positive direction.” I would have to say that this music succeeds well in reaching that goal. One Day In a Life is an auspicious debut! It is available from billwrenmusic.com, Amazon, CD Baby, and iTunes. Check it out! 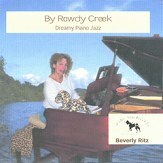 By Rowdy Creek is a soothing and relaxing collection of ten original piano solos by jazz pianist/composer Beverly Ritz. Living in northern California near the Oregon border, Ritz’s love of nature and the ocean is apparent in many of her song titles as well as her gentle rhythms and laid-back style. On a mission to preserve jazz standards and other beautiful music, Ritz’s music is readily accessible to most listeners yet complex enough to fascinate a more discerning ear. Hers is not the smooth jazz “fluff” that seems to be just about everywhere; this is music from the heart of someone who has been playing music since she was three years old and is completely at ease with the piano. The title track opens the set. Despite the “rowdy” title, this piece is smooth and very much at peace. I get a mental image of someone lying in the sun next to the creek in that blissful state between falling asleep and being awake enough to enjoy the sun’s warmth and the tranquility of the sounds of the creek. “Under the Redwood Tree” has a similar mood, although the music is different - a soothing musical daydream. “A Distant Dream” picks up the tempo a bit although it is still very relaxed and contented. The strong melody of “Aren’t You the One?” suggests that perhaps this lovely song has lyrics, but Ritz plays it so conversationally that words really aren’t needed - we understand what she is telling us. “In A Hurricane” was composed to honor those who died in the New Orleans nursing home during Hurricane Katrina. Far from funereal, this lovely piece is much more of a heartfelt tribute than an elegy. I love “The Cat In the Forest.” Alternately adventurous, cautious, and a little bit lost, the piece is graceful and gently rhythmic - a beauty! I also love the elegant, easy grace of “Dreams Danced (In the Sky),” which gives me visions of light, airy clouds swirling in a crystal blue sky. There are some dense, intricate chords in this piece that make it a real standout. Ritz saved the best for last (in my ears, anyway! ), closing with “The River and the Sea.” I’ve sat and watched quite a few rivers flow into the ocean and this piece captures the serenity of that experience - gorgeous! If you haven’t yet discovered the music of Beverly Ritz, this is a great place to start! By Rowdy Creek is available from www.ritzymusic.com, Amazon, CD Baby, and iTunes. Highly recommended! 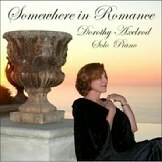 Somewhere In Romance is the solo piano debut of Dorothy Axelrod, a Southern California pianist and piano teacher with thirty years of teaching experience - even more than me! The fourteen selections are standards and film music that share the themes of love and romance, beautifully arranged and improvised by Ms Axelrod. Inspired at an early age by a concert performance by piano legend Liberace, Axelrod has had a lifelong passion for the piano that she shares with her students as well as her audiences. She performs regularly with her trio in Southern California, and releasing this album has been a lifelong dream. Passion and a very impressive playing technique imbue the music with a warmth that goes far beyond most CDs of solo piano cover tunes. It is very clear from her playing that Axelrod deeply loves this music and wants to share that love with her listeners. Fans of Robin Meloy Goldsby and Danny Wright will find a lot to like here. The album begins with “Sun and Moon” from Miss Saigon, a tender and heartfelt piece that builds to a passionate climax and then returns to a feeling of longing - a lovely start! “Cinema Paradiso” isn’t as familiar as some of the songs on the album, but deep emotion and flowing beauty are in every note. “My Funny Valentine” and “Autumn Leaves” are two of my favorite standards, and Axelrod’s arrangements are just right. One of the most enchanting movie themes ever is “Somewhere In Time,” and Axelrod makes it her own - soft and gentle yet sparkling. I also really like “Legends Of the Fall,” a graceful, dreamy theme played with a velvet touch. “All the Things You Are” was composed more than seventy years ago, but Axelrod brings it up-to-date with style and heart. “Here’s That Rainy Day,” a jazz standard from the 1950’s, is given a sweet and lovely make-over for the 21st century romantic. “Somewhere Over the Rainbow” is the ultimate daydream song - wistful and yearning. “Somewhere” from West Side Story is the fourth song on the album with “somewhere” in the title - undoubtedly the inspiration for the CD title! Also a deeply passionate song, Axelrod pours her heart into it without going over the top. Beautifully done! For anyone looking for romantic solo piano arrangements of familiar songs, Somewhere In Romance is well-worth checking out! It is available from romanticpianocd.com, Amazon, CD Baby, and iTunes.